Cutler & Gross sunglasses, via J. Crew, $420. Ugh, life is unfair. Am I right? Actually, let's be real for a second. 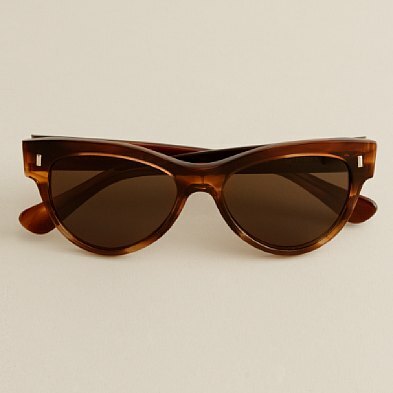 It's true that this is a classic, elegant pair of sunglasses that were hand-crafted in Italy. They could last a lifetime. I could pass them down to my daughter (really, she would pry them from my cold, dead, hands). Maybe the luxurious creation process is deserving of the nearly $500 price tag. However (and this is the big however), it's just not necessary to splurge this wildly on a face accessory that is not made of gold and/or diamonds. At least, not at age 25 whilst job-searching in New York City. It is absolutely possible to pay $30, $50 or even $150 on a pair of shades that look excellent, protect your peepers and deserve to be worn on a vacation you can afford because you did not pay $420 plus shipping for the most gorgeous sunglasses ever. *Seriously, J. Crew has this aspirational styling thing down to a science. You see the girl in the sunglasses, you see the car, the man, the hair, the smile. You think to yourself, me + these sunglasses = that life, no problem! Rawr.